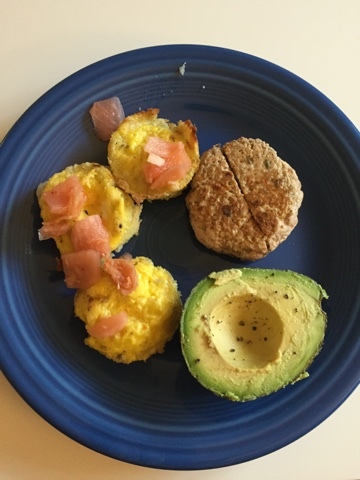 7:00 am Mashed potato egg cups topped with kimchi, homemade sausage and half an avocado. 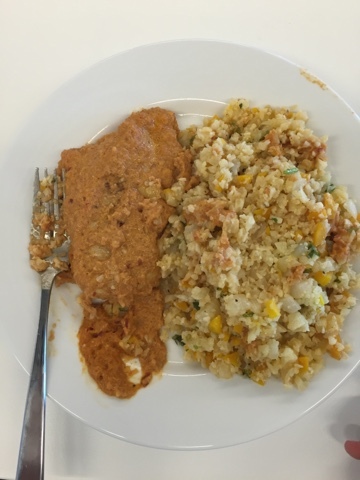 12:00pm Leftover curry chicken and cauliflower rice. Half an avocado. Not the most appealing picture, but I can promise it was very good. 7:00pm Chipotle with carnitas, tomato salsa, lettuce, guacamole. This week has been super busy but in a good way. I really like what I'm doing at work and I've been meeting up with friends after I finish work. I haven't been going to bed as early as I usually do and I'm really starting to feel rundown. At the moments in most tired during the day is really when I have cravings. I start thinking about cheesy carbs and sweets. I really miss tortilla chips. I need to devote a little more time to cooking food (twice I've cooked lunch the morning of which isn't ideal) and I also need to get enough sleep so I can stop daydreaming about tortilla chips and Julie's Mexican dip.